땅, inexplicably romanized as Tang (which makes me think of the strange orange drink), is no ordinary Vietnamese restaurant. Indeed, their catchphrase is (or was... I haven't seen it lately) 맛이 다르다, "the taste is different." When they say different, it truly is... the soup they call pho is quite odd, and actually, not really to my liking. We go here to eat one thing: buncha. 땅 is actually the first and only place I've tried buncha, meaning I haven't experienced it elsewhere and can't tell you how authentic this version may or may not be. So in the next few sentences, please insert the word "apparently" as needed. 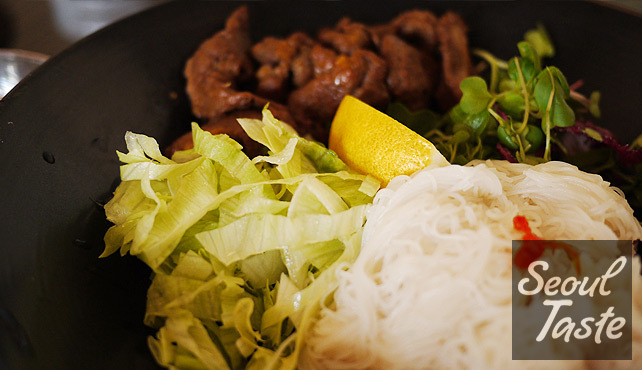 Buncha is a kind of Vietnamese street food, but 땅 presents it in a distinctively upscale atmosphere (along with a somewhat upscale price, which doesn't include tax). 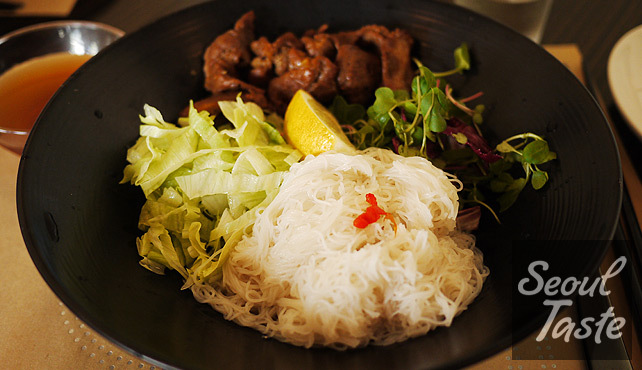 It is a combination of grilled pork, thin vermicelli noodles and lettuce, accompanied by a light & fresh, better-than-it-sounds fish and citrus sauce. 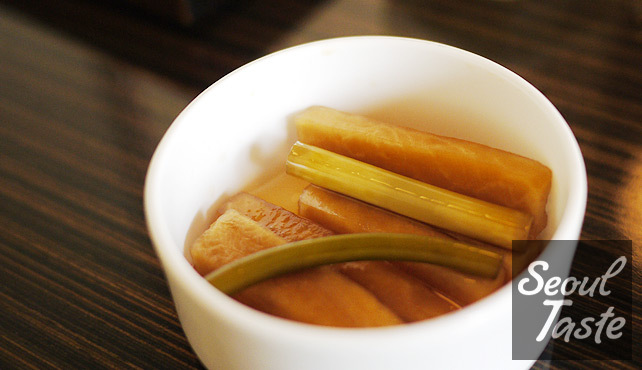 We received a single 반찬 with our lunch, a dish of pickled garlic stems and turnip in soy and vinegar sauce. These are definitely Korean-style pickles, and may be an acquired taste for some (Annie likes them a lot, though). Our food arrived after a lengthy wait, by Korean standards. 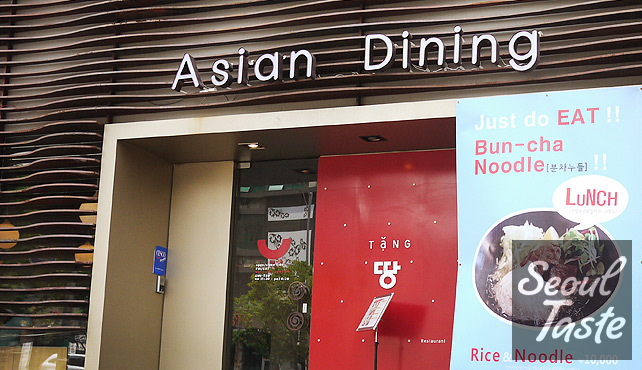 In Seoul, at lunch time, food is often served within 5 minutes of placing your order. It's worth the wait! The server recommended pouring the sauce over everything, but I prefer to drop the noodles into the sauce dish, place a piece of meat on top, then eat the noodles and meat together. Tips: If you go for dinner, bring a friend: they have a buncha dinner set for two. Alternately, you can order a set for 18000원 per person that includes an appetizer and a small bowl of pho. Side note: On our receipt, it says: "내국인: 2 외국인: 0" 땡! (Wrong!) Anyway, I thought it curious that (1) they would make that distinction, and (2) that it would appear right on the receipt. We get the feeling that they are actively trying to market to foreigners (their signs and promotions are in English, followed by Korean in smaller print), so they must be trying to keep score to gauge the effectiveness of their marketing. Food: 4/5 - Innovative menu, high quality ingredients, but docking 1 point due to relatively high price for the small portions. Service: 4/5 - Friendly service, but food is slow to come out (by Korean standards). Atmosphere: 5/5 - Classy, upscale look all around, including dishes & silverware, even down to the water bottle at the table. Getting there: Come out of 신논현역 exit #4 and you're practically there. The sign says "Tang."